And they arrived in the heavens before God's throne. The Holy Venerable Martyr Vadim (or Bademus) was a rich and noble citizen of Bethlapeta in Persia, who discarded his wealth on earth for heavenly glory and founded a monastery near that city, which he governed with great care as an archimandrite. The purity of his soul had never been sullied by any crime, and the sweet odor of his sanctity diffused a love of virtue in the hearts of those that approached him. He watched whole nights in prayer, and passed sometimes several days together without eating; bread and water were his usual food. Vadim conducted his life in the paths of perfection with sweetness, prudence, and charity. To crown his virtue, God permitted him, with seven of his monks, to be apprehended by the followers of King Shapur (309-379), in the thirty-sixth year of his persecution. Vadim lay four months in a dungeon, loaded with chains, during which he every day received a number of stripes. But he triumphed over his torments by the patience and joy with which he suffered them for Christ. At the same time, a Christian noble named Nersan, Prince of Aria, was cast into prison because he refused to worship the sun. At first he showed some resolution; but at the sight of tortures his constancy failed him, and he promised to conform. The king, to try if his change was sincere, ordered Vadim to be brought into the prison cell of Nersan, which was a chamber in the royal palace, and sent word to Nersan that if he would dispatch of Vadim, he would be restored to his liberty and former dignities. The wretch accepted the condition; a sword was put into his hand, and he advanced to plunge it into the breast of the abbot. But being seized with a sudden terror, he stopped short, and remained some time without being able to lift up his arm to strike. The servant of Christ stood undaunted, and with his eyes fixed upon him said, "Unhappy Nersan, to what point of impiety do you carry your apostasy! With joy I run to meet death; but could wish to fall by some other hand than yours. Why must you be my executioner?" Nersan had neither courage to repent nor heart to accomplish his crime. He strove, however, to harden himself, and continued with a trembling hand to aim at the sides of the martyr. Fear, shame, remorse, and respect for the martyr made his strokes forceless and unsteady; and so great was the number of the martyr's wounds, that the bystanders were in admiration at his invincible patience. After four strokes with a trembling hand, the martyr's head was severed from the body. Nersan a short time after, falling into public disgrace, perished by the sword (some sources say he committed suicide). 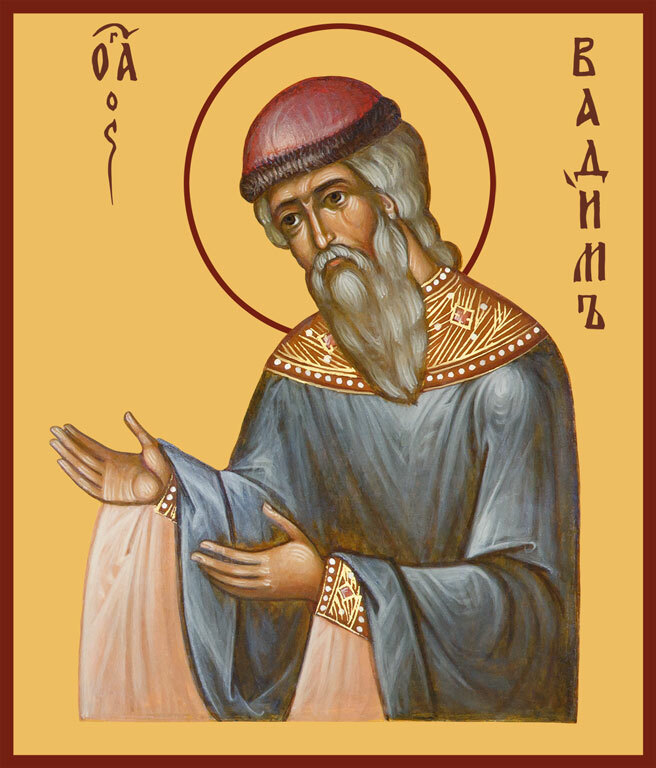 The body of Saint Vadim was reproachfully cast out of the city by the infidels, but was secretly carried away and interred by the Christians. His disciples were released from their chains four years afterward, upon the death of King Shapur (other sources say they were beheaded with Saint Vadim). 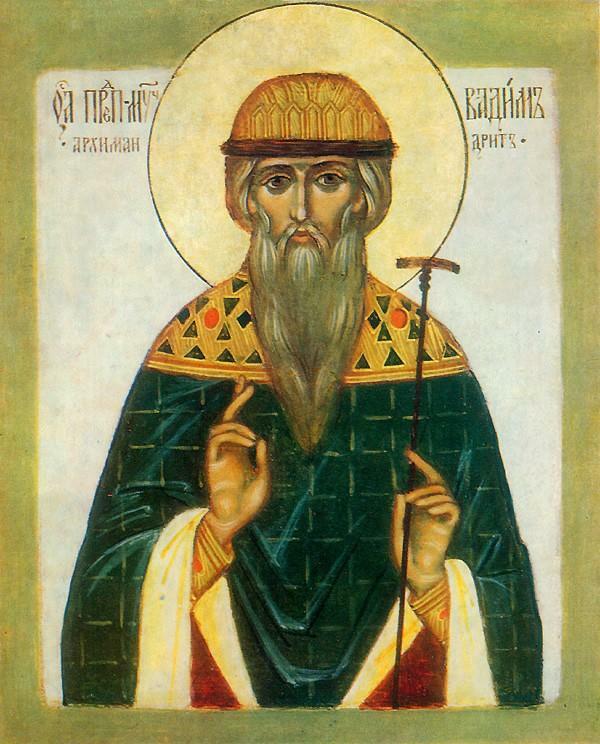 Saint Vadim suffered on the 9th of April in the year 376. And feels sorry for Nersan because misery befell him. Of God he is not afraid, but is afraid of the saint. Brandishing the sword and, brandishing, lowers it! Before the knight of God; in truth, a sheer coward! By yourself alone, your soul you lost. That the gate of the eternal kingdom, He opens to me. And, never more, to see you O prince. And, twice as black - one who slays Christians. And Nersan slew him with a quivering hand. Such a lion died from a frightened rabbit! But, who did Nersan slay? Himself or the saint? And to the saint of God, no harm came to him.